The pink peppercorns selected by Il Mercante di Spezie is a spice that shouldn't be cooked but sprinkled on just before serving. The evergreen plant from South America is in reality not a peppercorn at all but is called pink peppercorn because of its resemblance to a peppercorn as well as its aroma. Perfumed, with a vivid pink colour, it can be used whole or coarsely ground. Try it with your more delicate tasting dishes as it too has a delicate aroma. 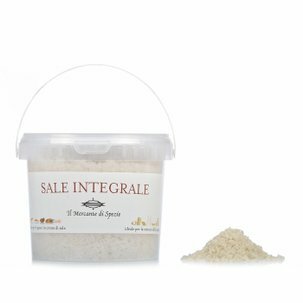 It accompanies dishes of white meats, fish or fresh cheese. 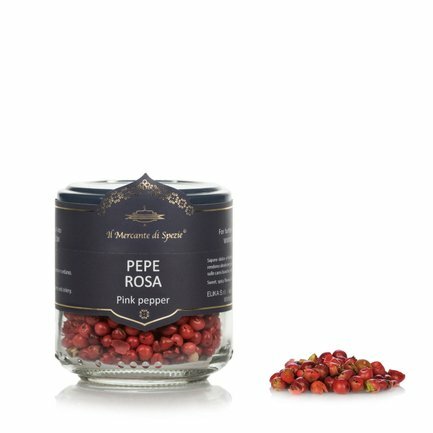 Use it also in marinades for grilled foods or experiment with it in pleasantly spicy cocktails. Ingredients Whole pink pepper. For more information on product labels, please contact our Customer Service department. The information on the labels of the products may vary for reasons beyond our control, therefore, there may be discrepancies between the information on the site and that on the products delivered. Please always check the information on the product before consumption or use.